This new update includes some fantastic new support including grading of high resolution and bit depth files, edits can be exported out of Final Cut Pro for finishing in the highest quality. 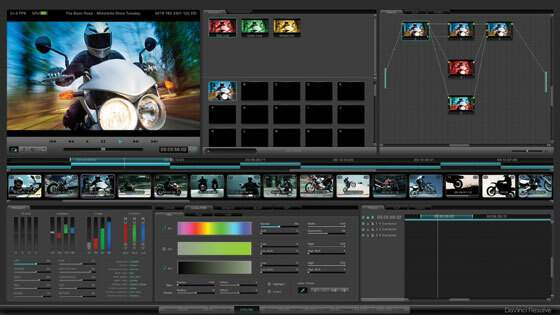 An alternative workflow is to use DaVinci Resolve 8.1 to manage extremely high resolution raw image formats such as RED, ARRI, CinemaDNG and DNxHD and then to grade and render to ProRes or uncompressed media for Final Cut Pro X.
DaVinci Resolve 8.1 also features a new layer node composite effects which offer colorists even greater creative grading with add, subtract, difference, multiply, screen, overlay, darker and lighten effects. DaVinci Resolve 8.1 now includes ACES colorspace support. ACES and IIF is a new colorspace and file format promoted by the Academy of Motion Picture Arts and Sciences technology committee to provide a universal and open image interchange and processing format. The ACES IIF file format is fully supported, and includes a variety of IDTs and ODTs as well as support for 3D shaper LUTs. Avid Media Composer users now have improved support for Avid AAF import/export for roundtrip editing to Resolve and back to Avid Media Composer. This new AAF support includes effects such as dip to color, edge and center wipe with border, clock and venetian blind wipe and also cross, oval and diamond iris wipe, overlay composite and more. Also includes support for Avid sizing with (PTZR) pan, tilt, zoom and rotate. DaVinci Resolve 8.1, supports a new cut, copy and paste operations for editing and node metadata including dynamics have been added, allowing much easier and dramatically faster editing of clips in the timeline and copying grades between nodes. DaVinci Resolve 8.1 also includes new conform features including the abilities to export missing clips EDL and import new EDL to a track.